Muhammad Rafiq Tarar (born November 2, 1929) was President of Pakistan from January 1, 1998 until June 20, 2001. During Pakistan's independence in 1947, Rafiq Tarar performed voluntary duty as a relief worker in camps set up by Muslim Students Federation for refugees, migrating from India to Pakistan. Muhammad Rafiq Tarar graduated from the Islamia College in Gujranwala, in 1949. 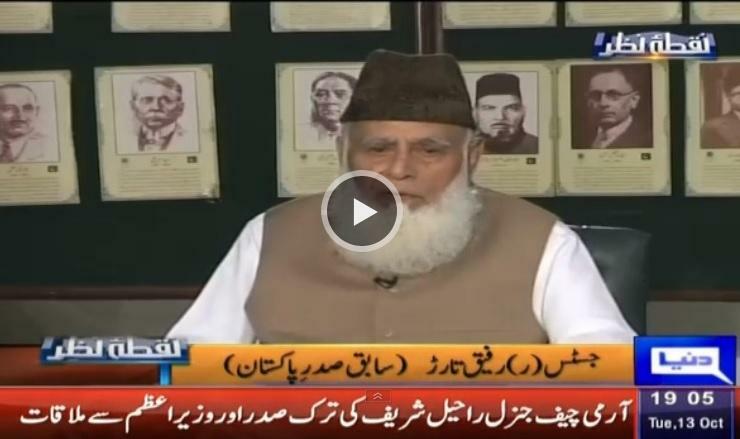 In 1951, Mr. Tarar secured his Law Degree from Law College, Lahore. During the same year he was enrolled as a Pleader. He also was enrolled as an Advocate in the Lahore High Court during October 1955. After graduating, he established a practice in Gujranwala before rising to the position of Additional District and Session Judge and later District and Session Judge.In 1971 he became Chairman of the Punjab Labor Court. He was alleviated as a judge of Lahore High Court in October 1974 and later became the Chief Justice of the same court in 1989. Earlier, during his days as Judge of the Lahore High Court, he also served as member of the Pakistan Election Commission. Justice Muhammad Rafiq Tarar was elevated as a Judge of the Supreme Court in January 1991, from which he retired in November 1994 on attaining the age of 65 years. He was brought out of his retirement by Mian Muhammad Nawaz Sharif and afterwords he was elected as member of the Senate in 1997 on the PML(N) Party ticket.Later in the same year he was elected as the President of Pakistan on December 31, 1997with record number of votes..
During his presidency, Tarar was mostly a figurehead ruler. The Presidency of Pakistan's powers had been slowly removed over the years, culminating in 1997 Thirteenth Amendment to the Constitution of Pakistan which removed virtually all remaining reserve powers, making the office almost entirely symbolic in nature as per the true spirit of the Pakistani constitution. Tarar was not removed from office when Pervez Musharraf seized control of the Pakistani government in 1999. While Prime Minister Nawaz Sharif was deposed, Tarar was allowed to remain in office until 2001, at which point Musharraf assumed the presidency in an attempt to both gain legitimacy and restructure Pakistan's model of government to a more presidential system rule.